This project is a great example of the importance of not hiring unlicensed, unskilled handymen. This old shower was installed by an un-licensed, unqualified handyman who apparently did not know that water runs down hill. This turned out to be costly for the homeowners. The shower floor was constructed with the drain set higher than the rest of the shower floor. The shower always had a half inch of standing water on the floor that will not drain. The PVC plastic waterproof membrane was installed improperly causing it to develop leaks years later. This in turn caused water damage to the subfloor, and a wall. The toilet wax ring was also leaking, and on it’s way to causing more water damage. Fortunately it was corrected in time. Notice the old shower with a half inch of standing water and the water damage that was visible in closet next to the shower. This new tiled shower is 3″x 6″ subway tile with two niches that have glass accent tiles that match the floor tile. The back wall was extended out an extra two inches to make the niches deeper. A precast Swanstone shower pan was also a part of the design. 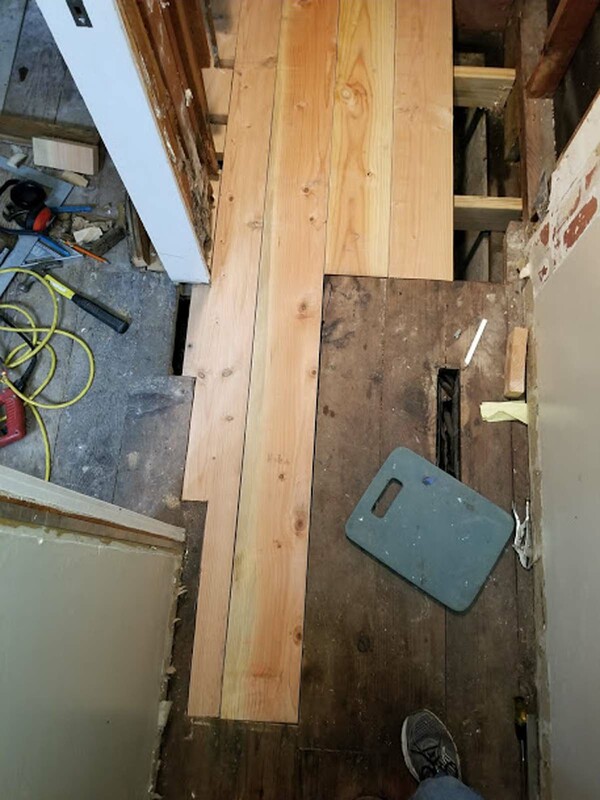 I installed a Moen Posi-Temp water valve, with Align style trim and a new Kohler one piece toilet in addition to 12″x 24″ floor tile set in a subway pattern.